With folks heading out for the first three day weekend of the summer we wanted to share our favorite breakfast recipe that we fix on the last day in camp. Every camp cook knows the hassle of trying utilize leftovers and this recipe goes a long way in solving that problem. This recipe was given/taught to me by an old river running buddy at Upper Cliffside camp along Middle Fork of Salmon River over thirty five years ago. Mel started by having me dice up some onions and garlic. Then he started pulling leftovers out of the cooler including leftover River Baked Potatoes, half a steak, a pork chop, and two grilled chicken breasts and diced these up too. 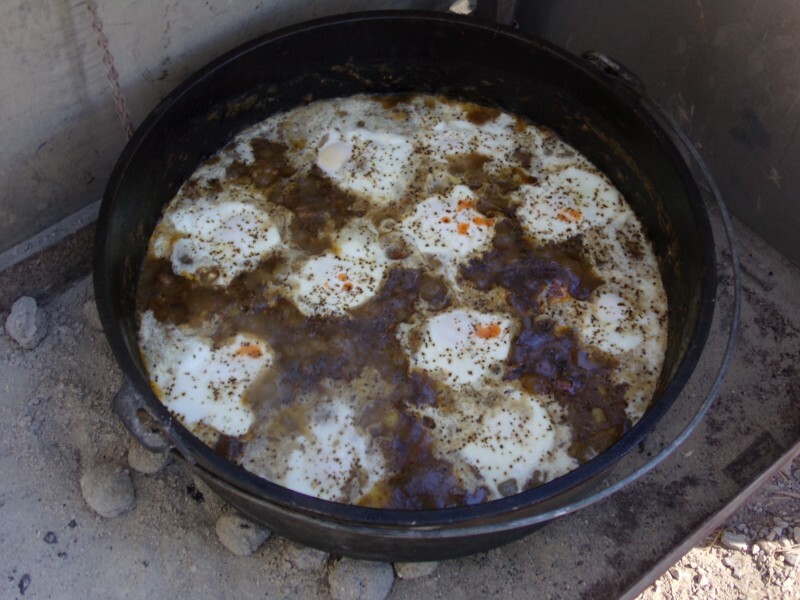 He used beef broth as his liquid as he combined everything in a 12″ aluminum Dutch oven on the camp stove which is the hash part of this recipe. When most of the liquid had reduced off the hash, he made six divots in the hash and broke an egg into each one. While he was stirring the hash I lit some charcoal and pre-heated the Dutch oven lid. With the pre-heated lid it only took about 7-8 minutes for the eggs to cook. The “Wide Eyes” of this recipe are the eggs staring up at you when the lid is removed. We’ve modified the recipe to use au jus from a Dutch oven brisket which adds much more flavor than the beef broth. By chilling the au jus overnight we’re able to skim off the fat which makes this a healthy as well as delicious way to utilize leftover. You can make this in any size Dutch oven depending on the size of the crew you’re feeding. For a big group we a 16″ Dutch oven as pictured above. As a side note like most folks I’ve watched more than my share of cooking shows and have never seen a show devoted to leftovers except one of our Public Television episodes where I prepared this recipe. It was a great way to close out filming that series as we were able to use all the leftovers resulting from the filming. Here are the recipes as given in our first book, Dutch Oven & Other Camp Cooking. the cook getting bored and throwing all the leftovers together. So was born this recipe for hash. make it the night before and just reheat for breakfast. hash as a side dish. charcoal or use a shovel full of coals from the camp fire. you take the lid off it looks like a “Wide Eyed Monster” of sorts.